I’m a new employee with your organization. I’m really excited to become part of your team. You hired me for my expertise; I know I’m going to do a great job, but I still need your support. I need to know what’s in it for me. I need to know where I fit in. I need to know that you’re looking forward to my contribution as much as I’m looking forward to contributing. I need to be reassured that I made the right decision in joining your organization. It’s not just about a paycheck or a solid medical plan (although those things are important to me). I need to become immersed in the company and into my role so I can quickly become a productive member of the team. What is your organization doing to address the needs of your new employees? These needs are legitimate, warranted and very common. Give your incumbents peace of mind by creating a welcoming environment that addresses their concerns and eliminates their doubts. 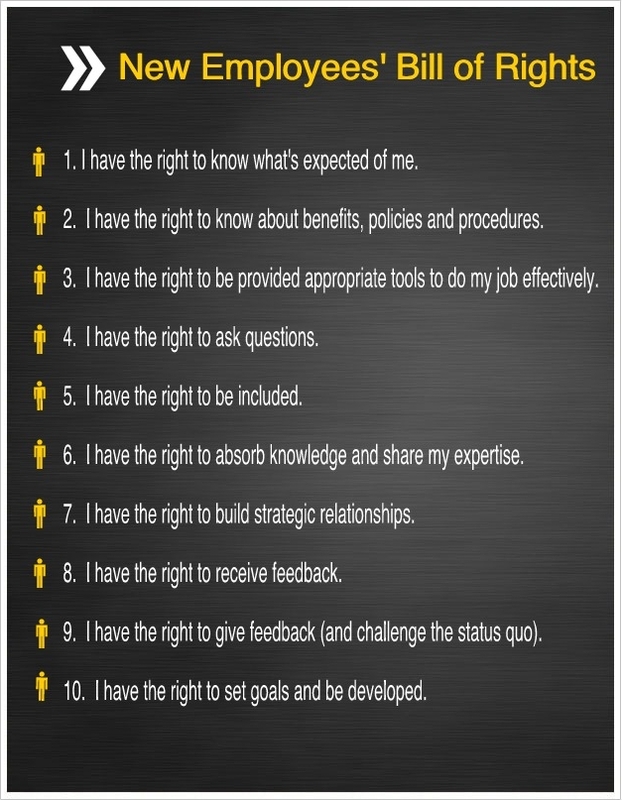 A great strategy is to craft a Bill of Rights as part of your preboarding or onboarding program. Let incumbents know what they can expect as they join your company. Get the support of your Leadership team. Involve your hiring managers. Gain the support of your other stakeholders. From the job posting, to the interview process, to meetings and projects, a new employee should know what the job will require. Be clear with the information you provide. Answer questions honestly. The employee should know exactly what s/he is signing up for. Make the Orientation process as simple and clear as possible…no one likes a barrage of paperwork. Give the employee exactly what is needed to become aware of pertinent information. Be consistent with all new employees, so everyone has all the information they need. The first day on the job is overwhelming enough – clarity is critical. 3. I have the right to be provided appropriate tools and resources to do my job effectively. It’s sad how often employers are simply unprepared for their new employee on his/her start date. Workstations aren’t organized. Computer access isn’t set up. Co-workers haven’t been told about their new teammate. Paperwork isn’t ready. You hire a person, you prepare for their start. No excuses. Encourage dialogue. Have an open-door policy, and let the new employee that you (and the rest of the team) are available. People don’t know what they don’t know. All the questions aren’t going to be asked on the first day. As context develops, the questions will come. Social and cultural integration is critical to an employee’s long-term success, engagement and loyalty to your organization. A new employee needs to have a sense of belonging. Invite him to lunch. Find out when his birthday is. Ask about his kids. Include him in the routine mid-afternoon walk to the vending machine. Weave him into the social fabric of your team. Involve the new employee in projects and cross-functional initiatives early on. Get him involved, and give him opportunities to showcase his expertise. Not only does this foster his credibility, but it jump-starts his productivity and gives a sense of purpose. “It’s not what you know, it’s who you know.” The old saying holds true for joining a new organization. As a veteran employee, hiring managers and co-workers have typically learned who the go-to people are in the company…who to count on when you need an answer, or need something done in a pinch. Introduce your new employee to key individuals early on by scheduling meet-and-greet sessions, assigning a “buddy”, or involving him in a mentor program. Let him know how he’s doing. Hiring managers should balance scheduled and impromptu coaching sessions to check in and offer feedback during the employee’s first several weeks. continuously. This isn’t a post on the importance of coaching, but all employees deserve this…not just your new employees! Companies don’t make progress by standing still. New ideas and fresh perspectives keep teams moving forward. Solicit feedback from your new employee often. Their experience and vantage point might give you a solution you’ve been seeking or a more efficient way of doing things. Embrace their suggestions, and keep an open mind. Encourage employees to constantly seek opportunities to sharpen their skills. All employees should have a development plan, to develop in their current role, address skill/knowledge gaps, or prepare for future career path or growth opportunities. Help your employees develop a plan, and hold them accountable! Create an environment that celebrates self-directed learning. Take advantage of in-house professional development opportunities, as well as seek external training or online resources! Ten commitments you should be making to new employees. Communicate these commitments during the hiring process, during Orientation and on the job with the hiring manager/team throughout the entire onboarding process. Demonstrate these commitments by setting an example every day, at every opportunity, with every employee. Build on the natural momentum and engagement an incumbent feels when starting a new job! Love this perspective Michelle. It’s why one of my favorite speaking topics at Onboarding Conferences is “Through Their Eyes: Use Your New Hires’ Perspective to Shape Your Onboarding Process”. All too often we focus on what WE want to tell the new hire versus want they NEED and WANT to hear. Certainly the new hires themselves should be considered one of our most important “customers” of the process. Absolutely! Gaining feedback throughout the entire long-term process is so important, as is making the most of every touchpoint we have with our new employees. Thanks for sharing! Allan Dubyts • Great comment Michelle! It goes a long way to making that person feel comfortable and build trust. I am curious as to how an organization would implement that to ensure it is being followed, or how they monitor when there is a breech of one of the rights. Can you share an example of how you would first present that to an employee and what the process looks like after that? Hiring managers are their own “layer”. It’s so important to educate, enable and engage them about their role in the onboarding process. Their buy-in is crucial to a successful implementation! Educate = Share the initiative at a high-level, and help them understand their role in the process. Engage = Encourage feedback, ongoing support, resources and an environment that celebrates this. An endorsement from senior leadership is key! To ensure that the plan is being followed, I would recommend taking advantage of your touchpoints with new employees (orientation, follow-up, surveys, interviews, coaching sessions, etc) to interject questions that capture useful information/data specific to this initiative. Use your data to monitor, review and periodically update your process to ensure that you are current with business objectives, values and other specifics that are pertinent to your business. Hope this helps! Thanks again for sharing your thoughts!